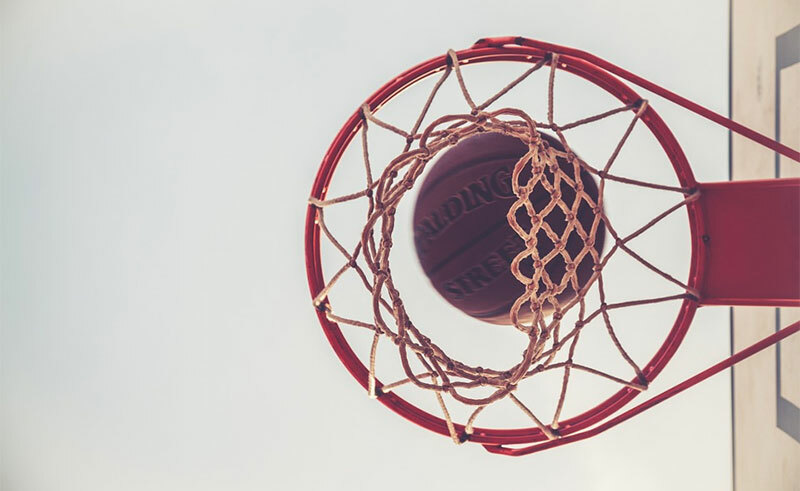 Setting up a basketball goal for the driveway can be a simple or a complex as you like, depending on how seriously you want to take the activity. A home court is a great way to practice shooting, and to enjoy playing. Basketball is one sport that requires very little equipment – just a ball and a goal – and it is one that can be enjoyed an entire lifetime. There is a huge variety in price of a setup, ranging from $100 to several thousand. The age and size of the person using the equipment is the main consideration. The standard for organized sports is a goal 10-feet off the ground, with a backboard that is made of wood or fiberglass. There are three main sizes, a five, six or seven. For whatever reason those names have stuck, but other sizes are very rare and hard to find. The standard ball is has a circumference of 29.5 inches and weighs 22 ounces. This is called a size seven, and is what is used in high schools, colleges and in the NBA. Women’s sports uses a size smaller. It has a circumference of 28.5 inches and weighs 20 ounces. This size ball is also recommended for boys ages 11-16. The smallest is 27.5 inches in circumference an weighs 18 ounces. This one is recommended for children under the age of 12. There is a “toy” ball and goal that is usually plastic and very portable. These are for very young children and are usually not considered “real” balls and goals. The standard goal size is 18 inches in diameter, attached to a backboard that is 72 inches wide and 42 inches tall. Backboard sizes can vary, but the size of the goals remains constant. Goals may be made out of plastic or metal, and some have hinges that allow them to be played with more aggressively with little danger of them getting broken. The industry standard for backboards is acrylic and are clear. These are the most like regulation style backboards. The most basic backboards are made of graphite, and designed to be affordable. There are also polythylene backboards, which are a middle ground of sorts for recreational use. The standard height is 10-feet, and you can of course put one at any height you like. Sometimes goals are attached to poles, edges of roofs or other structures. But there are goals you can get that come with a backboard and pole attached which are called stands. These cost more, but are more like regulation style setups. These can easily be adjusted to as low as six or seven feet, and up to 10 feet or even higher if desired. You could adjust the height for children, and gradually raise it over time as they grow. With these setups it is easy to change it or when the adults want to play. Having a stand then, is much easier to adjust than if you have a backboard attached to a pole or a building. There are stands, and there are simple poles attached to a backboard, though these are not as adjustable. There are two ways to go in setting up your system. You may put the pole, or the stand, into the ground permanently, or make it portable. An in ground system is one where you put a pole into the ground, and put concrete around the base to make it permanent. Be sure you want to keep it where you put it because it is a major endeavor to move it later. These take up less space, and are usually cheaper, but you do have the drawback of not being able to move it. Most stands are of the portable variety. These have a large flat base at the bottom that must be stabilized. You may use bags of sand, rocks or even water, to hold the base in place. This does take up more space, but you do have the advantage of being able to move it to a new place. There are also different levels of balls and setups. The beginner level is usually made of less expensive materials an designed to be inexpensive. A whole setup can be bought for less than $300. These have smaller backboards, but can usually be adjusted somewhat. Intermediate setups are around $400, have an easier adjustment mechanism and a larger backboard. They may have springs on the goals so you can play more aggressively. A step up from that is a more solid system with a standard sized backboard. The expert model can cost well over $1,000 and is designed for adults and for constant use. It is made out of more rigid materials that can take rough handling. Some of these have hydraulic automatic lifts to adjust the goal.